After falling sharply yesterday, crude prices are $46.58 this morning, a penny above their closing point yesterday. Prices struggled yesterday, giving up $1.32 during the trading session as refineries in the Gulf shut down, reducing the demand for crude oil. Prices have been mostly flat this morning. Fuel prices are much stronger this morning after weakness yesterday. Diesel prices are up 1.74 cents (1.1%) this morning to $1.6526. Gasoline rose 1.5% this morning to $1.7383. 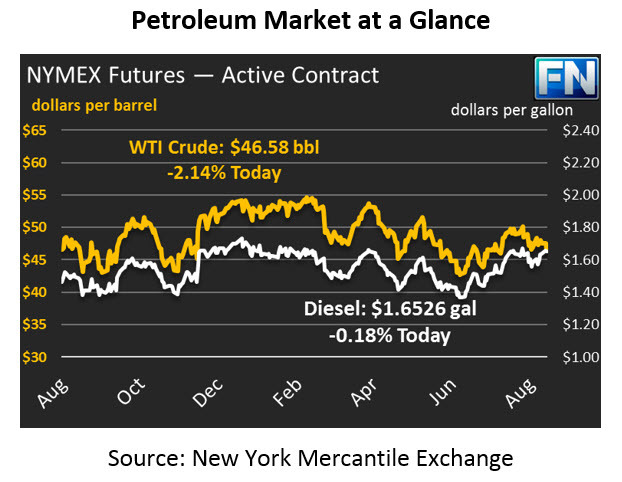 Both products saw prices drop sharply yesterday, with diesel losing 1.5 cents and gasoline shedding nearly 5 cents. Expect fuel prices to continue fluctuating significantly over the coming days in response to refineries coming on and off line. Crude prices are reacting to Tropical Storm Harvey shutting in refining capacity. The API is due to release its inventory report this morning. The numbers will likely prove a mixed bag – with so much refining capacity offline, crude inventories will likely rise, while refined product inventories will fall significantly. Keep in mind, however, that a 2.5 MMbbl crude stock build is common for this week of the year, so only a large build would be a surprise. Harvey continues to dump rain in Houston and South Louisiana. The FUELSNews team will be sending out an update specific to the storm later this morning.